representing the host yacht club and the PNW! 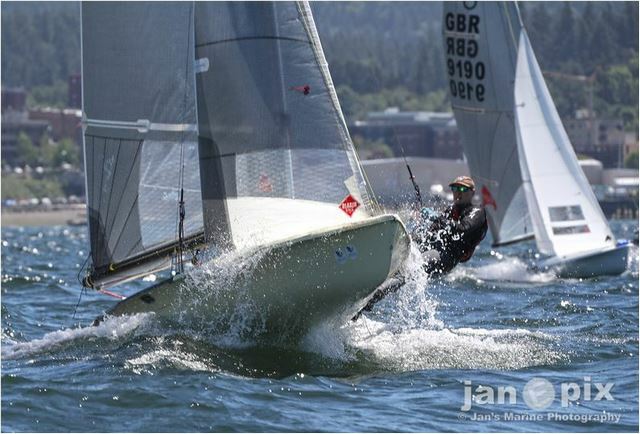 Bellingham Yacht Club hosted the 5O5 Pacific Coast Championships on June 15-17 on Bellingham Bay. Seven professionally run races occurred in varied conditions over the three days by PRO John Pedlow. Thirty-two teams attended the event and the pool of talent was deep. Several current/former world champions were present including Mike Holt, Rob Woelfel, Mike Martin and Howie Hamlin. The list of titles won by the top talent would exceed the limits of this brief report and perhaps even bore the reader. The competitors also included weekend warriors, college students and recent graduates. In fact, there was at least one competitor who graduated that same weekend from WWU. Teams traveled down from BC and up from Oregon and California. Doug Hagan flew in from Maui and the former International Class President and current class liaison, Pip Pearson came all the way from Australia. The father-son team of James and Ethan Brown drove all the way out from Alberta to race together on Father's Day weekend. Walking around the boat park before racing it was clear that a great range of talent and ages were present, it was also equally clear that 5O5 sailors are united by their passion for the boat and class. Something that sets 5-oh sailors apart is their openness and congeniality. 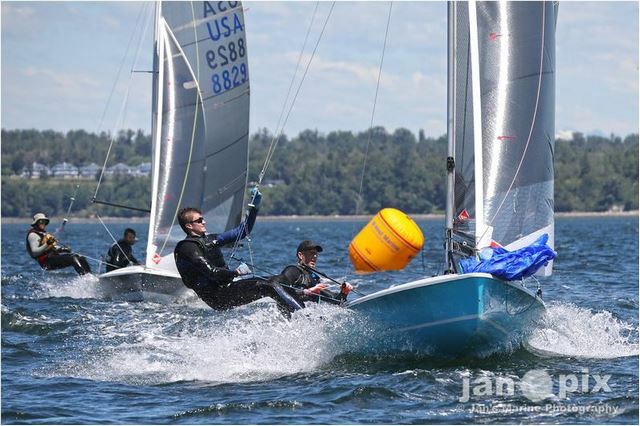 Boat set-up, sail trim, and tactics are openly and enthusiastically discussed by all competitors before, during and after racing. The goal seems to be to go faster together. Indeed the unwritten class goals seem to be, go faster, learn more and have as much fun as possible. 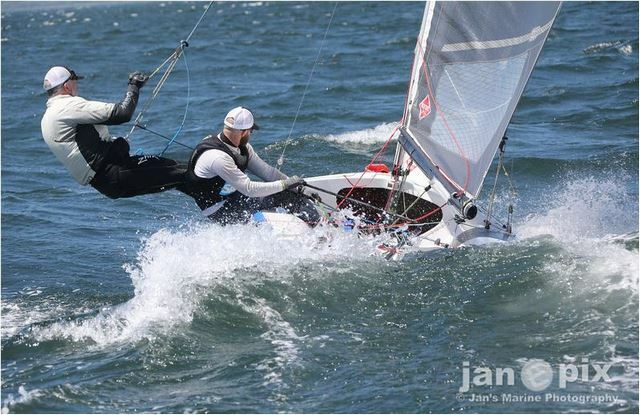 Many of the competitors arrived early on Thursday, rigged and practiced on the bay in 10-15 knots from the south in champagne sailing conditions. 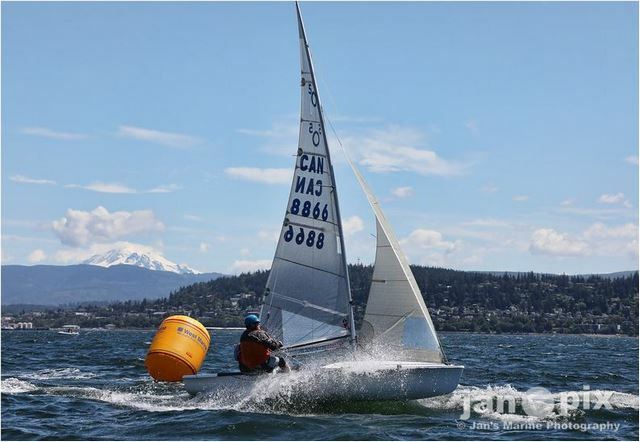 The forecast for the weekend was for wind from the northwest, an unusual and often undependable wind direction for Bellingham Bay. Friday the wind lingered in the high single digits and was shifty. In race one, abundant weeds and lulls in the middle and left were painfully experienced by those on that side. In race two, the weeds had cleared and the left seemed favored. On Saturday, before racing many were busy making weed sticks to clear their rudders. As it turned out, the northwesterly filled in early with an unusual vigor. The wind and waves seemed to clear the bay of the eel grass, or maybe the boats were just going so fast they didn't see or care about the weeds as they blasted by. 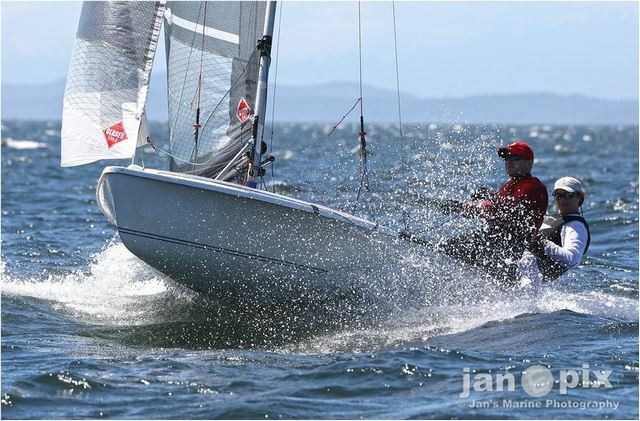 Four races were run in 14-18 knots, at times gusting higher. It was full-on planning conditions. Finding pressure and lifts led to big gains at the higher speeds. There were abundant thrills and more than a few spills too. 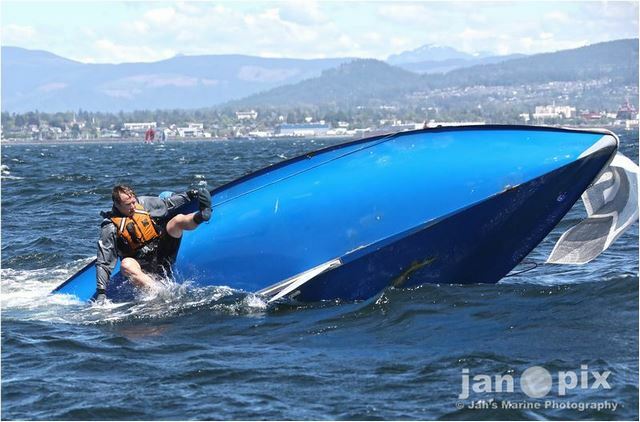 The racers returned to shore tired, sometimes bruised but always smiling. 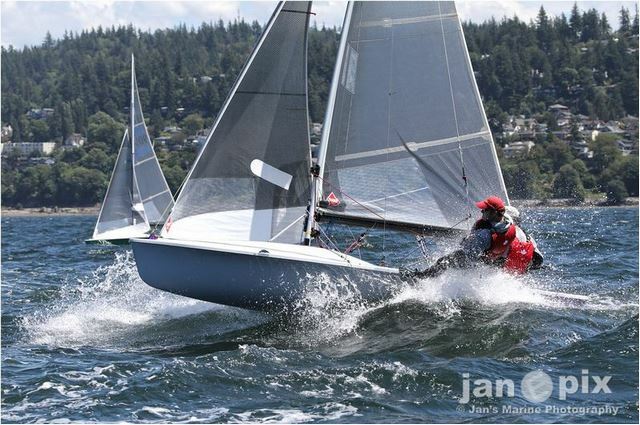 The 5O5 is pure joy to sail, whether you are in the front or at the back of the fleet. 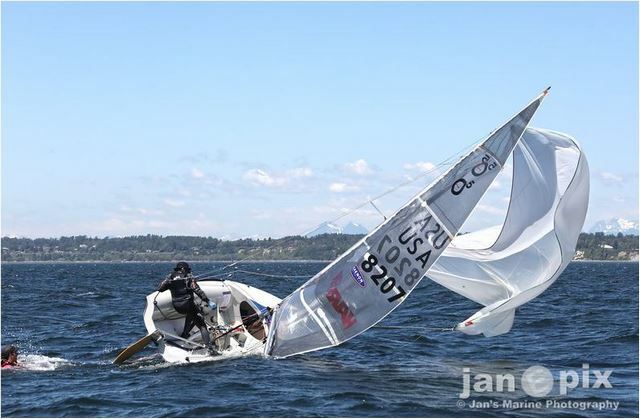 Jim and Susan Holstine hosted a fleet party at their home on Lake Samish after racing on Saturday and it was a fantastic finish to the fabulous day of sailing. Mike Martin said it was, "the best regatta party" he had ever attended, a notable comment from someone who has attended a plethora of sailing events around the globe. Sunday the northwesterly filled in late with its more typical, lackadaisical tendency. The RC got off only one race. Initially, there was some wiring upwind. However, by the end the wind shifted and faded to a whimper. 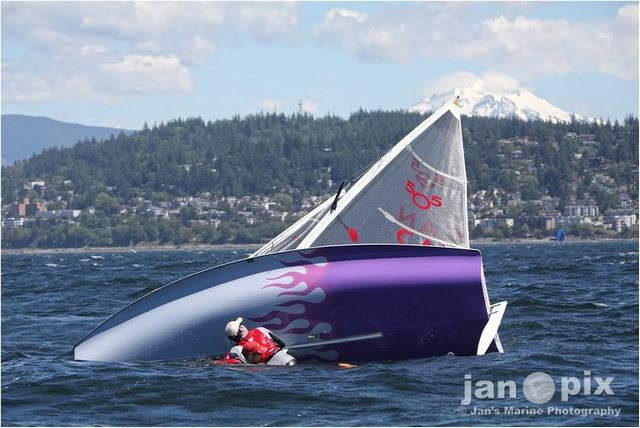 Former world champion, Mike Martin and his crew Adam Lowry took away the gold. They had sailed amazingly consistently with 2-(11)-1-1-2-2-2 finishes. Current world champions Mike Holt and Rob Woelfel finished second. 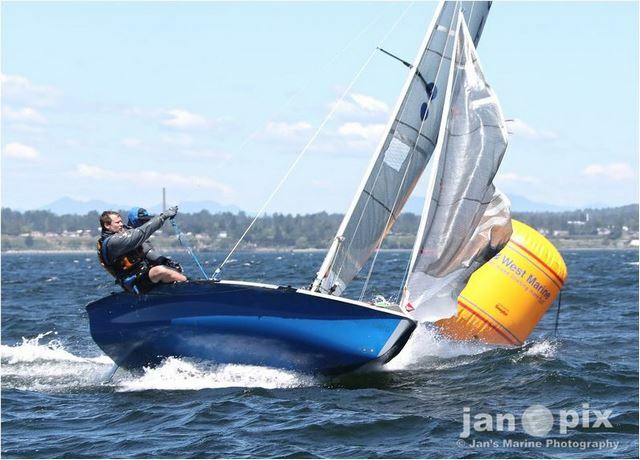 Former world champion and legendary 5O5 sailor Howie Hamlin and his crew Jeff Nelson were awarded third place. But by the looks on all the faces after, everyone was a winner. Thanks for Mike Poulos, regatta chair, for organizing a fantastic event and to all the BYC volunteers for making it all possible!